Whoosh! In 42.79 seconds the elevator went up 77 floors. Without a wobble. Without my heart skipping a beat. Q1, world’s highest residential building, is so tall that if one man were to work on it, he would have taken 628 years to dig, hammer and chisel. I took less than a minute to get beamed up 339 metres of the 20th tallest building in the world. That my adventure holiday in the Gold Coast would begin with a whoosh, the itinerary sure did not mutter that. But boy! When I peeped from the spotless window panes of Q1, Gold Coast took my breath away – 75 kms of unbroken coastline, skyscrapers reaching out to the heavens, white wave infringing the blue of the sea and people looking like tiny specks on the powdery beaches. Those fragments of what looked like a fuzzy watercolor pumped in some adrenaline too, my thoughts got peppered with optimism that I would harness myself on a surfboard, muster speed and conquer the audacious waves. But that optimism was just so naïve. One look at the surfboards and the barmy waves, the thought of slithering into the skintight Speedo and taking the first lessons in surfing at the Surfers Paradise washed away all the pumped up grit. I settled for something absolutely timid. I tucked my flowing skirt, walked to the beach, settling for its calm and the errand of picking dainty sea shells. Perhaps I looked a little odd at the Surfers Paradise. Nobody goes to the Paradise to laze on the beach, you go there to surf. Gleefully. Vigorously. In a skirmish between human grit and tempestuous nature. I saw many warming up to stretch the breath longer while others were so lithe on the board that they seemed glued to it. As I sat there, I flipped through the brochure that talked of 108 things to do in the Gold Coast. Surf, I could not, but I was still left with 107 options. Not bad, I thought and started scouring. Conveniently, I whittled the definition of adventure to hugging a koala. That I could take a walk with the tigers in the Dream World Theme Park seemed a tad outrageous for the day. But the koala would have had to wait, there was the Giant Drop, the tallest free-falling ride in the world, or so says the Guinness Book of World Records. In 90 seconds you are winched up the 120-metre high tower that is equivalent to 39-storeys and then plummet in 5 seconds. Even watching it can get someone woozy, so quickly does the gondola drop from what looks like as high as heaven. When my spine tingled and my heart boomed I thought I would catch my breath in The Big Brother House that is tucked away in the 85 hectare verdant jungles or twirl in the Dorothy’ Rose Tea Cups. But I skipped the bright Tea Cups and refused to get drenched in the River Rapids. A buffet at the Billabong restaurant that serves Jain and halal food was waiting, so were the koalas, those cuddly marsupials that sleep for 20 hours a day, get up to get cuddled, photographed and then snooze. What a life! The koala seemed so oblivious to the raucous crowd screaming their lungs out with doses of fear on Mick Doohan’s Motocoaster, Australia’s first motorbike rollercoaster, and spinning at 360 degrees in The Claw. My stomach was churning and when I walked past the gigantic alligator that could probably gobble an elephant in one sigh, I baulked and stood in the shade with Marilyn Monroe. Yes, a Marilyn Monroe, the blonde in a white taffeta gown with an oversized pair of sunglasses leaning on a shiny, black vintage car in Warner Brothers Movie World. She looked as dumb as a blonde is purported to be, but she perhaps was more benign than the Sumatran tiger at the Dreamworld with whom you can have breakfast. Literally. For you go on an early morning walk with leashed tigers, on return while the tiger feeds on mounds of meat nearby you can nibble on your dainty croissants and quaff a coffee. At Movie World, Marilyn Monroe is not adventurous, she is plain respite. The adventure is all about the macho guys, like the Batman Spaceshot that would have your head reel and the Wild West Ride where you travel past ghost towns and geysers and then drop 20-metres at the 75 km an hour. If that sounds easy mathematics, try doing it. You would wish you came packed with the doggedness of the Wild West cowboys. 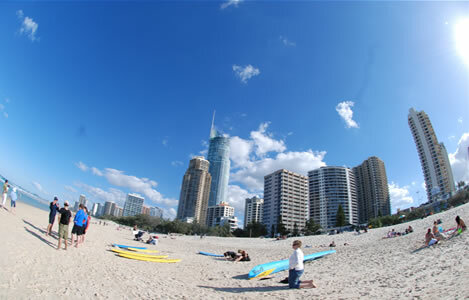 A few hours and I was spiritedly ticking off from the 108 things to do in Gold Coast list. The Q1, Dreamworld, Movie World, Surfers Paradise the count looked impressive. I was raring to get back home, sit at the dining table and be a canny raconteuse, talking of all the adventure in the Gold Coast. Cannily, of course, because I would neatly leave out all about heart that missed its beat, that Speedo that I never wriggled into, the earth-shattering scream, the numbness that follows a drop from 39 storeys and the swift refusal to take the Superman Escape that does 0 to 100 kms in two seconds. I could not let absurdities – and a hapless heart - creep into a riveting adventure story. I thought I had hit the denouement in my Gold Coast adventure story, but that night I would change it. As I sat in the dark auditorium of Conrad Jupiters to watch the Zingara show where five motorcyclists rode their slim bikes in a tiny steel cage, my jaw dropped and I dug my nails into the blue chair. They revved their engines, their tyres spat fire and their sirens wailed…In the background, the lilting music reached a petrifying outcry. What if the motorcyclists made a mistake? I shuddered. I did not want my Gold Coast adventure story to end in a mawkish rant. I closed my eyes. My story could not end in a misadventure. It had to end happily. And I continued being adventurous in the Gold Coast.